Carbon emissions (and CO2 equivalents) are known to be responsible for global warming, so there is now a high urgency for a transition to a low carbon economy. 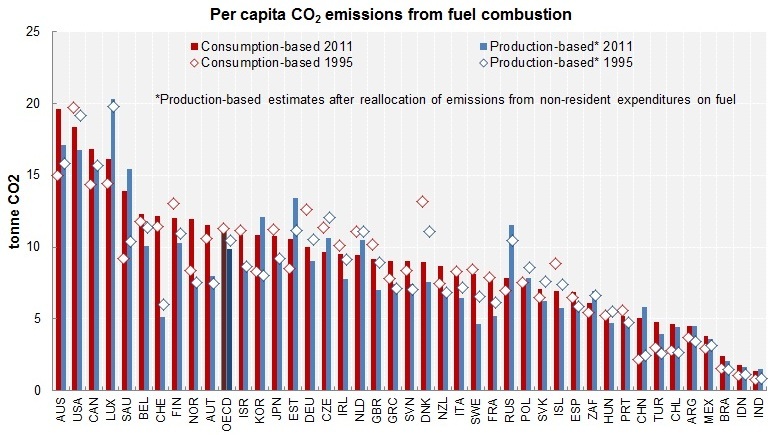 Carbon emissions around the world are measured using various metrics and methods. How countries compare depends on a number of factors. For example, China has the highest total whereas countries like Qatar, the United Arab Emirates, and Australia have very high CO2 emissions per capita. Here are some useful sources of data. Governments have a critical role to play in the transition towards a low carbon economy and the Paris Agreement is a key mechanism of the United Nations which will help make this happen. Some countries, like the United States and Canada, have pledged to lead the world in this process – refer to media on this topic (March 2016) here. In July 2016, the European Union presented a plan for a transition to a low carbon economy, aiming to reduce emissions by at least 40% by 2030. Businesses around the world have been increasingly held to account in relation to carbon pollution and business now accepts must be regulated (for example, through a carbon price) and curbed if we are to minimise the effects of dangerous climate change. The OECD has published a report on the transition towards a low carbon economy – a business case entitled, ‘Transition to a Low-carbon Economy: Public Goals and Corporate Practices’ (published November 2010). Although there are certainly barriers to change, business can even benefit by reducing emissions. Here’s a 3 minute film from the UK Government about how some companies are interpreting the idea of a low carbon economy although the constraints of a finite world and the emerging impacts unsustainable growth remains a challenge for corporations. Here’s a popular 6 minute film from the 21 Century Office (a WWF project funded by a grant from Hewlett Packard) summarises the benefits of and opportunities for cutting carbon. The film explores some of the ways carbon becomes embedded in products such as cars and computing infrastructure. Beyond Zero Emissions (through their Zero Carbon Australia project).